Thank you from the very bottom of my heart! JAX is a USA Today Bestselling Book, and I can’t tell you how much this couple meant to me. To tell you the truth, I was the tiniest bit worried to send surly (or not so much?!?!) Jax and unconventional Seven out into the world. Their interactions were packed with raw honesty and real-life messiness. We read to escape, but also… we want to relate. On surface level, both of Jax and Seven didn’t seem normal, but wow, I think they were so relatable. Much love and on to the next book! Happy reading. 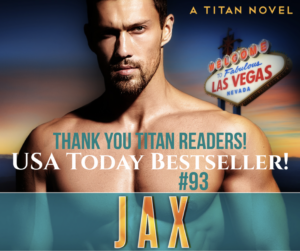 Curious what Jax is about? Well, here’s the blurb! Seven Blackburn is an Enigma. A motorcycle club princess and the daughter of a notorious gangster. She’s a straight-shooting single mom deadset on ridding a powerful motorcycle club of their South American drug cartel connection. But not all players are ready for the game to change, including the ones she can’t see. The CIA. Jax Michaelson has a Bad Attitude But a Good Shot. The former Navy SEAL has been on Titan’s problem list since he showed up for work. Call him cocky. That’s fine, because then you’d have to admit he’s the best at everything. Except diplomacy. Seven becomes an unexpected bargaining chip and Titan is forced deeper into the seedy world drug cartel glitz and Harley-riding MCs right. Can Jax be the hero Seven needs when a life as Mayhem motorcycle club princess backfires and her children disappear? JAX is available everywhere! Paperback and audio book versions coming soon! « Start Reading Jax Now: First Four Chapters! Get exclusive content, behind the scenes info, freebies, and birthday giveaways.